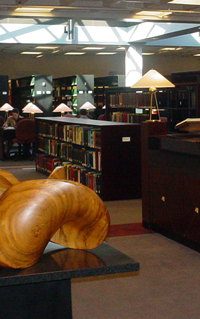 The O'Quinn Law Library collection is available to the general public during the posted operating hours. Borrowing privileges are restricted. Borrowing privileges are reserved for currently enrolled University of Houston students, UH faculty and staff, and visiting scholars sponsored by UHLC Administration. In order to borrow materials from the library or the Reserves desk, a Cougar1Card must be presented. Reserve materials that a non-borrower wants to use within the library only, may be removed from the Circulation desk in return for a photocopy of a valid identification card (school photo ID, driver's license, or state bar card). Circulating law material may be borrowed for a two-week loan period and may be renewed for an additional two-weeks if no hold is placed on the book. Renewals for these materials may be done by phone (713.743.2300), in-person, or from the on-line catalog (http://library.uh.edu). Books checked out for four hours may be renewed up to four times, if there is no hold placed on the book. Two-week circulating materials, $0.50 per day, per item up to $10.00. After a $10.00 limit has been assessed, the patron will be required to pay for the book plus a $20.00 processing fee. Four hour materials, $0.50 per hour up to $4.00, then $2.00 per hour until a $10.00 maximum is reached. After a $10.00 limit has been assessed, the patron will be required to pay for the book plus a $20.00 processing fee. Recall fine, $0.50 per day. Patrons must pay any Law Library fines owed before being allowed to checkout any additional Law Library materials on their library account. Payment may be made with exact change or by check made payable to the University of Houston.